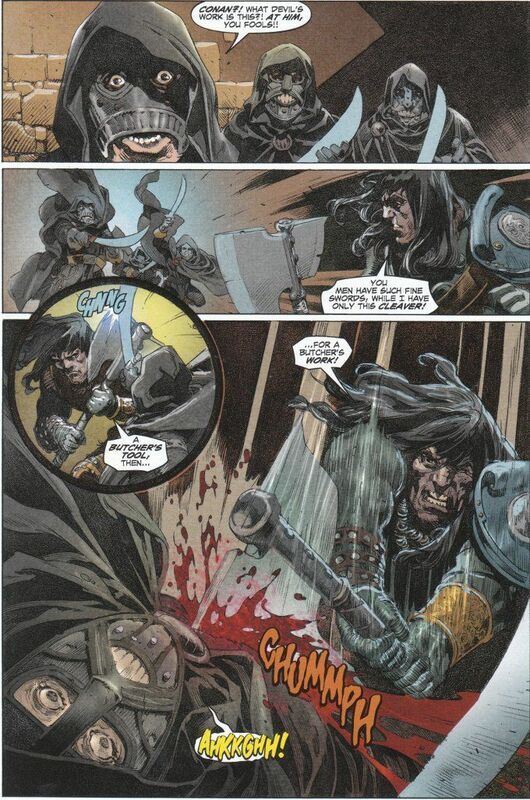 King Conan: The Hour of the Dragon #5 proves a welcome change of pace from last month's issue. The fourth issue of this series, which I did not review last month, was a bit of a snoozer. There was little action past Conan's rescuing a prophetic witch from some wicked mercenaries and a lot of talk meant to give Conan a direction to move in his quest to reclaim his usurped kingdom. All of this was all well-written and well-depicted, yet I can't help but feel such exposition should have been condensed somewhat to allow for more action. This issue, by contrast, is almost nothing but action. Indeed, most of the issue is taken up by one long action sequence! Our focus is on Conan as he seeks to rescue the Countess Albiona from the executioner's block - a fate decreed for her in the face of her refusal to wed the usurping lord Valerius. Despite being based around the most cliched pulp-plot ever, Robert E. Howard turned a leaden concept into golden treasure. So too does Tim Truman take Howard's prose and tweak it to better fit the graphic novel format. 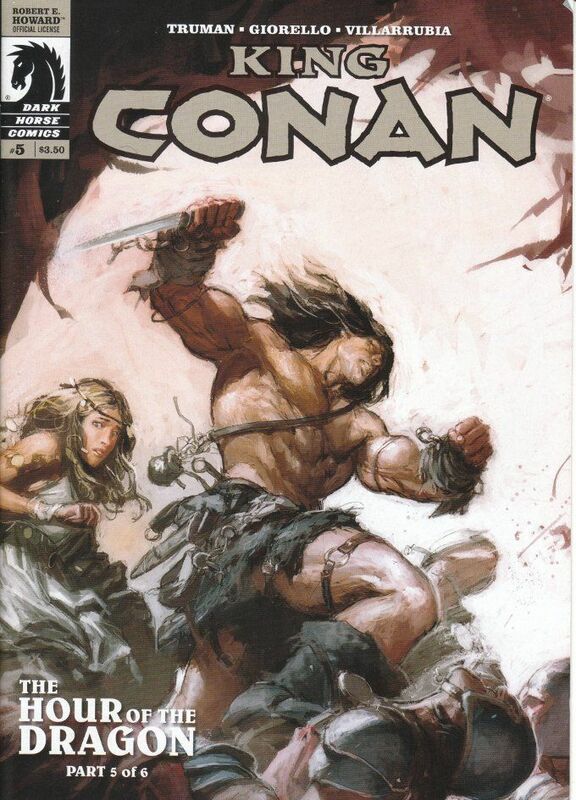 The action of the issue is thrilling but also showcases how Conan has changed as a character over time. We learn of Conan being a progressive liberal by the standards of Hyboria, allowing his subjects to worship whatever gods they wish, so long as their rites do no harm to others. The crude chivalric code the barbarian adopted in his later life is also well in evidence, given his treatment of the beautiful young countess he has rescued. It is the countess who represents the one fault I find in the artwork this time around. Though it may be foolish to complain of cheesecake and fan-service in a Conan book, Albonia spins the entirety of the issue in a ragged dress that is more rag than dress. It's particularly vexing given there is no reference to her being nearly naked in the original Howard text and because Albonia is otherwise presented as a strong-willed young woman who will stand for her convictions even in the face of torture and certain death. You are better than this, Mr. Giorello. Please remember that in the future.